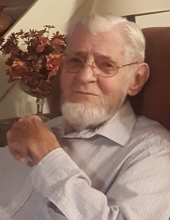 Glen Earl Holzer, 85, of Stillwater, headed for Heaven March 22nd 2019. He passed peacefully with his wife and five children by his side. He has gone to meet his Savior. He will be joining his parents and siblings. Funeral services have been entrusted to the care of Dighton-Marler Funeral Home of Stillwater. Visitation will be Monday, March 25, 2019 from 1:00 PM to 8:00 PM at Dighton-Marler Funeral Home. Glen is the son of Charles and Minnie Mae (Barrett) Holzer. He was Born November 16, 1933 in Payne County, OK. The family moved to California during the dustbowl and stayed a few years before heading back to the Midwest with stops in Missouri, Adair, OK, and finally Stillwater. Glen enlisted in the U.S Army in 1953, spending time in Germany during the end of the Korean War. He drove large trucks and moved military equipment across Europe. When he returned to Oklahoma, he worked construction with his brother Ora, and then put his driving skills to work driving propane trucks for a while. In 1956, Glen met Lela Leach, the love of his life, working at the Payne County Court House in Stillwater, OK. They married on February 9, 1957 in Duncan, OK., and they have spent 62 memorable years together. Glen went to work at the OSU Creamery in 1958 and would spend the next couple decades producing and packaging a multitude of Oklahoma State branded products including: milk, ice cream, cheese, and a campus favorite “Orange Drink”. Glen continued to advance with the university and retired from the Animal Science Department’s Dairy Barn in 1995 after completing a 37-year career with OSU. Glen is preceded in death by his parents; 3 sisters, Billie Madison, Aleta May Gates, and Doris Hines; 6 brothers, Charles Holzer Jr., Jolly Holzer, Chris Holzer, Lawrence Holzer, Lloyd Holzer, and Ora Holzer. He is survived by his wife Lela Holzer; son, Gary Holzer and wife Marsha of Malone, WI, son, Rick Holzer of Stillwater, OK, daughter, Tammy Holzer-Riney and husband Mark of Highland Village, TX, son, Rusty Holzer and wife Kim of Edmond, OK, son, Marty Holzer and wife Pam of Wentzville, MO, sister, Mary Holzer of Fairbanks, AK; 10 grandchildren; 11 great grandchildren; numerous nieces and nephews; and a host of friends. Glen will be deeply missed by all who knew him. Memorial contributions may be made to Marena Cemetery or Karman Legacy Hospice in c/o Dighton-Marler Funeral Home, 5106 N. Washington, Stillwater, OK, 74075. To send flowers or a remembrance gift to the family of Glen E. Holzer, please visit our Tribute Store. "Email Address" would like to share the life celebration of Glen E. Holzer. Click on the "link" to go to share a favorite memory or leave a condolence message for the family.